WAIST HIGH: Happy 25th Birthday High Land, Hard Rain. Happy 25th Birthday High Land, Hard Rain. 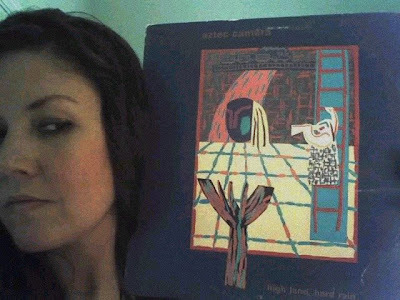 The debut album by Glasgow band Aztec Camera, High Land, Hard Rain went to #22 on the UK Albums Chart and was said to be, by David Fricke of Rolling Stone in September of 1983, "the kind of pop record you were afraid they didn't make anymore. Fear not automatic-pilot drum machines and humorlessly percolating synthesizers." Aztec Camera's line-up changed numerous times in its first few years. The constant member was Roddy Frame, who by 1987 "was the only de facto member of the band: this and future albums credited to Aztec Camera were actually performed by Frame and studio musicians hired on a track-by-track basis." Roddy Frame has been credited with being slightly ahead of his time. When he wrote, arranged, and recorded High Land, Hard Rain, he was just 19 years old. "Frame, a stellar acoustic guitar strummer, fills the 13 songs with jazz chords, and Aztec Camera's grooves foreshadow British jazz popsters The Style Council and Everything But the Girl. Whether making you dance or reflect, Frame proves a master craftsman."